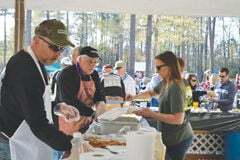 Ruritan Club members serve Barbecue, Shad, and all the fixings during the 2018 BASH, formerly known as the Shad Planking. Last year a traditional Wakefield rite of spring underwent a rejuvenation when the Ruritan Club’s Shad Planking became The BASH. (Barbecue and Shad Homecoming.) The result was a banquet for the senses with the sounds of great music and laughter, the smells of smoke from fires cooing shad, and the taste of the barbecue and fish as friends and neighbors of all ages enjoyed eating, dancing, and mingling while children frolicked under the trees. As always at the event, many seeking or already in political office were on hand to meet people in their districts from all over Southside Virginia. This year, as the Club celebrates its 90th Anniversary with the 2019 BASH on April 20, the event will be even better, according to BASH Co-Chair Buster Haywood. The positive sentiment was enthusiastically echoed by folks who attended last year’s BASH, such as Alan Jenkins of Waverly. Smiling about local reactions, Haywood said, “We’re even starting the event off with an Easter Egg Hunt, plus a variety of music. We’re providing the top shelf “County Seat Band” performing bluegrass at 3:30. Then LOL, the rock band from last year will perform. We’re trying to reach out to all ages. My goal was to bring this together as a community event, with families and children and to bring neighboring towns in our tri- county area – Southampton, Sussex and Surry – together. This year we’ve got Wakefield, Waverly and Ivor fire departments involved. I feel truly overwhelmed and so happy with the community support. The 2019 Wakefield Ruritan Club B.A.S.H. will be held rain or shine on April 20 from 3 p.m. to 8 p.m. at 12205 Brittle’s Mill Rd. in Wakefield. All-inclusive tickets are available at Wakefield Farm Service, Ivor Furniture, Haywood Financial, or from any Ruritan as well as online at wakefieldruritans.com or through Wakefield Ruritan BASH on facebook. Prices are $30 for 21 and above, $20 under 21, and all children under 10 get in free. Lawn chairs are welcome but no coolers will be allowed. For more information call (757) 899-3222.